About 50 uniformed police officers marched into Marjory Stoneman Douglas High School in Parkland, Fla., early Wednesday as classes resumed for the first time since 17 students and teachers were killed by an expelled classmate with an AR-15, thrusting them into the centre of the nation’s gun debate. “This is a picture of education in fear in this country. The NRA [National Rifle Association] wants more people just like this, with that exact firearm to scare more people and sell more guns,” said David Hogg, who has become a leading voice in the students’ movement to control assault weapons. “I know one of those bullets could be shredding through me if I was misidentified as a school shooter,” Hogg added. 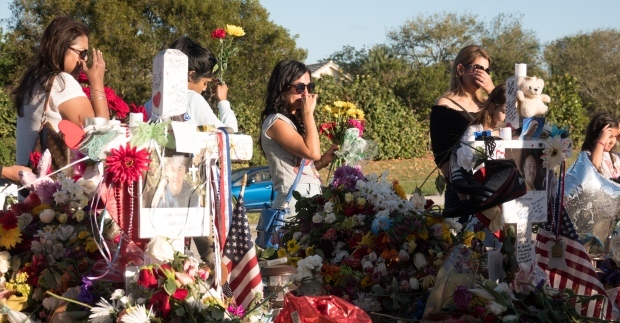 Grief counsellors are on campus as well “to provide a lot of love, a lot of understanding” and help students “ease back” into their school routines, Broward Schools Supt. Robert Runcie said. Officers with therapy dogs also stood outside. Wednesday’s class schedule started with fourth period, so that students and teachers could return to the people they were with during the shooting. The freshman building where the massacre took place remains cordoned off. 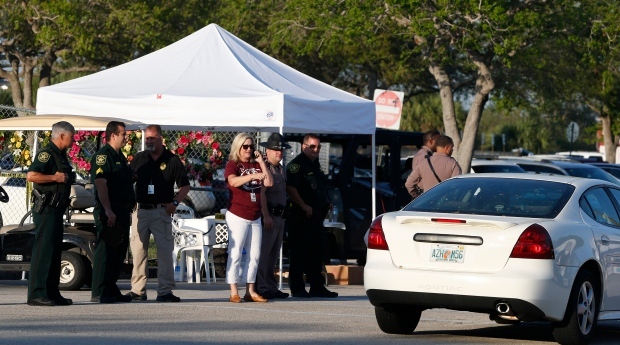 A long line of cars circled the school, and dozens of television trucks and vehicles were camped out nearby as students, parents and staff were ushered through a security cordon. A banner saying “Welcome Back Eagles” covers the main entrance, and the walkway leading onto the campus was lined with flowers, photographs and other memorials to the those killed. Some of the students were returning despite severe gun wounds, but even those who weren’t hit by bullets spoke of emotional trauma. Alexis Grogan, a 15-year-old sophomore, planned to wear a Stoneman Douglas colour — maroon — on the first day back to class Wednesday, plus sneakers that say “MSD Strong, be positive, be passionate, be proud to be an eagle” and “2/14/18” in honour of those who died. She felt nervous, like it might be too soon to go on as usual without slain friends like Luke Hoyer, who sat two seats behind her in Spanish class. Still, the support from her fellow students and their fight to strengthen gun control laws have buoyed her spirits. The students returned to school after a whirlwind of political activism that has reignited the gun and school-safety debate. Douglas sophomore Charlotte Dixon said some of her friends are having a hard time returning to classes. But like Grogan, they are encouraged by the attention to gun laws their actions have brought. On Tuesday, relatives of the Stoneman Douglas victims kept up the pressure in Florida’s capital with emotional testimony during a legislative hearing to discuss passing a bill that would, among other things, raise the age limit to buy long guns from 18 to 21. The House appropriations committee’s 23-6 vote in favour of the bill Tuesday followed more than four hours of emotional discussion with the parents of some of the 17 killed, and nearly two weeks of activism by students on social media and in televised debates. Sidney Fischer, 17, was in a Holocaust history class when the shooter aimed his gun at the window and shot into the room. Two students in his classroom died. He’s planning to wear swim goggles on his first day back Wednesday to honour his friend Nicholas Dworet, who was an accomplished swimmer.